One of the first sure signs of spring is the occurrence of ants in the house. In most cases, you are observing ants that live out-of-doors and are entering your dwelling in search of food. They are most commonly observed in the kitchen and other areas associated with food preparation, consumption, and storage. The species most commonly sent to the Department of Entomology Diagnostic Clinic are carpenter, pavement, acrobat, pharaoh, and odorous house ants. The carpenter ant is, by far and away, the most commonly asked about pest of structures. 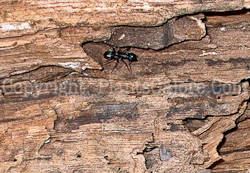 Damage from carpenter ants is the result of their nest building activities. The characteristic sign of an active nest is a small pile of coarse sawdust mixed with small black pellets (excrement) around or below a hole in the wood or near a small crevice. The coarseness of this sawdust is quite different from the very fine, powdery sawdust produced by the powder post beetle. Common areas in structures where carpenter ants are known to nest include: small stud cavities near windows and doors, near leaky water pipes and sewer lines, beneath leaky sinks, under toilet bowls where the paraffin gasket may be leaking, leaky soffit cavities, and in foam insulation. If you have observed carpenter ants in your home over a period a few weeks or more (especially during the cold months) a colony may have taken up housekeeping. If this is the case, the carpenter ants may be telling you that there is water damaged wood in the structure and the ants are maintaining a colony nearby. It is extremely important to find out where the ants are coming from for two reasons: to determine if they are nesting in your home and to determine if there is water damaged wood in your home. In a sense, the carpenter ant is trying to tell you that you may have some structural problems that should be repaired. They are not necessarily the problem, but rather a symptom of a problem! If you only observe them for short periods of time during warm weather they are probably outside nesters roaming around looking for a meal. Carpenter ants do not eat wood fiber. They are scavengers. They love people food. The most likely sites for outside nests are old rotting stumps or remnants of a removed tree, wood piles that have direct contact with the ground, stacked "punky" lumber, tree cavities, a wood deck with wet timbers, etc. 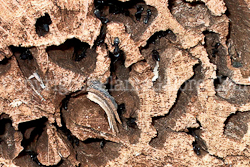 Carpenter ant galleries (nests) are often mistaken for subterranean termite feeding galleries. 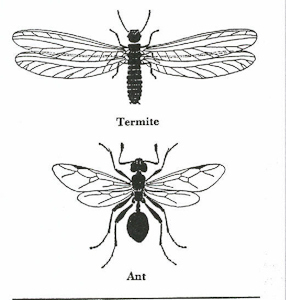 Termite galleries (tunnels) are lined with a clay-like mixture of excrement (frass) and soil, whereas, carpenter ant galleries are bare and smooth. Ants can be distinguished from other similar insects, such as bees and wasps, by the presence of a constricted area with small humps located between the thorax (body section aft of the head) and abdomen (last major body section). The constricted area is called a pedicel and will have one or more humps. There are several species of carpenter ants. The most common is the black carpenter ant. The pedicel of the carpenter ant has one hump. Carpenter ants are large. They vary in size, ranging from 1/4" to 3/4". Carpenter ants have a rounded abdomen. If the ant you are trying to identify has a one-humped pedicel, is large in size and has a rounded abdomen you have a identified a carpenter ant. Prevention is the best carpenter ant control strategy. Periodically inspect your domicile for water damaged wood. Take special care to carefully inspect areas where water pipes and other pipes go through walls, base of toilets, around bath tubs and the base of shower stalls. Regularly caulk, weather strip, or otherwise repair openings to the out-of-doors such as around window panes, where pipes go through walls, and door jambs. Check your roof for water damage. Pay special attention to areas under shingles and the slashing around chimneys, standpipes, and roof and bathroom vents. Often times it is difficult to determine whether carpenter ants have a colony inside the dwelling or if they are roaming in and out of the structure without being detected. If this is the case you may want to consider using a "bait". The use of a bait will lure the ants to feed from a source that you can easily observe. You will then be able to watch the ants come and go and determine the origin of the population. Carpenter ants like sweet and greasy foods. Our bait recipe is two parts jelly or jam and one part canned dog or cat food (the cheaper the better). The portion doesn't need to be more at a half a cup. Divide the gruel up into two or three smaller portions on a pieces of foil. Situate the bait in an area where ants have been observed. Take special care to place the baits in an area safe from children and pets. The ants will start coming to your bait. Observe where they are going. When you see that they are feeding on your bait regularly, it is time to change the recipe. Mix up a new batch of bait using the same ingredients and add boric acid to the mixture. A tablespoon of boric acid for each cup of bait mixture will do the job. The ants will carry the "poisoned" food back to their colony. Because they are highly evolved social insects the food will be passed around and shared in the nest. Eventually, this should destroy the colony. Change the bait regularly to keep it fresh and moist. There are also commercially available hydrazone and propoxur baits. Ready-to-use formulations of chlorpyrifos and propoxur are also available. Read and follow all labels strictly. If you use non-bait controls for carpenter ant control you run the risk of creating several "satellite" colonies if you do not destroy the colony completely. Satellite colonies result from the disturbance of a colony containing a queen. If the queen is killed the remaining worker ants will vacate the main colony and create several other smaller colonies. The bait recipe is effective for most ant species found in the home.